Alpine expands its line of performance Marine speakers with the SPR-M70 Type-R series component system designed for high-end boat sound systems. These speakers are built to handle a lot of power and still perform under harsh Marine environments. On top of that, they are extremely easy to install and provide an excellent sound upgrade to any boat. Your normal car audio components can't take the abuse of the Marine environment for long. The elements like water, salt/fog, and the blazing sun can cause your system to quickly breakdown in a short period of time. Because of this, Alpine has engineered the SPR-M70 to withstand the harsh Marine environment. The SPR-M70 has undergone rigorous ATSM-B117 testing for salt/fog to help prevent corrosion. The grills, speaker cones, and speaker housing pass the ASTM-G154/D4329 accelerated weather test for superior UV protection to prevent sun damage. Finally, the SPR-M70 also passes the IPx5 test for water resistance. All this engineering and testing will provide the best sound experience and reliable performance for your boat season after season. The SPR-M70 is built around an efficient titanium dome tweeter and 7'' mid bass that provides clear, loud sound reproduction output in open-air environments. 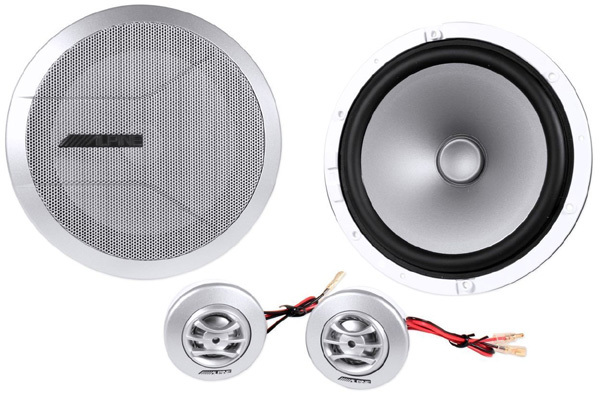 These speakers are designed to handle 75W RMS / 210W Peak power. Centrex grilles and high-strength, non-resonant, high-temperature ABS frames provide hardwearing durability. The SPR-M70 uses Santoprene® surrounds that offer high quality frequency response performance and 1'' titanium dome tweeters for clear, crisp highs. Also, the tweeters are swivel mount to allow you to direct the highs to exactly where you want them. All this provides the best sound quality and performance possible so you can get loud on the water. The SPR-M70 includes two types of grilles in the box so you can choose the exact look you want for your boat. Select from the Classic grille or the Sport grille so you can have the perfect design for a wide variety of boat interiors. 1. Refer to the installation section for fitting instructions. Alpine SWR-T10 A New Generation of the Unrivaled Type-R The Type-R Thin subwoofer series ..